This member of the Solanaceae occurs sporadically in Southern England, where most people would call it a 'weed'. 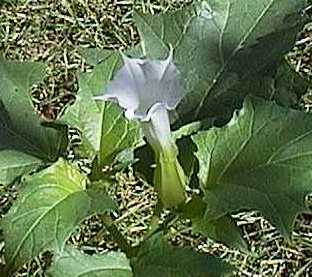 It displays the same attractive features of some of the larger species of Datura, but on a smaller scale - sweetly scented flowers, opening at night, and lasting only a little while into the next day. This specimen was about 30cm tall, with the flower 6cm long, but the plant can grow quite a bit larger than this. The flowers are followed by the spiny seedpods, which give the plant its common name: 'Thornapple'. As with some other 'wild' plants, the seed is difficult to germinate to order, but will come up if and where it feels like it. 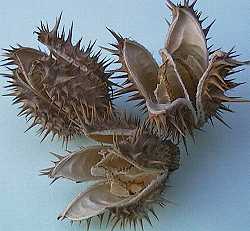 Like other species of Datura, the plant is highly poisonous.